theme parks and similar venues. river and the Tamar Estuary at Plymouth. A rugged coastline of towering cliffs and great surfing waves. course the great facourite of them all, St Ives. 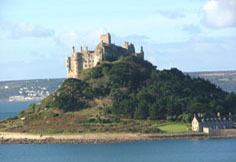 with St Michaels Mount, a small island fortress well worth a visit. of sands at Marazion and Porthleven and yet further on at Mullion Cove.